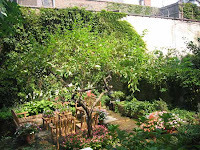 When I first came across this site, I was determined to book a night at a New York Bed and Breakfast. I didn't know that bed and breakfasts existed in NYC. I know, I know...pretty naive. Everyone (including me) always focuses on the hotels. Well, I saw a few inns that I wanted to visit. My plan was to stay there after The Jonas Brothers Concert on August 6th. That day, my car broke down. My mini-van was in the shop and the other car was out of commission. Long story short, there weren't any cars available for rental. This was MY birthday gift for The Diva, so instead of staying at the Bed and Breakfast, I rented a limo to take us to the concert. She had a good time and was thrilled to meet the guys...again. I'm taking The Diva to see B5 in September, so I plan to stay at one of the beautiful inns NYC offers. Hey, you only live once and I'm really sick. I don't know what I have, but deep down inside...I know it's serious. Anyway, I wanted to share a picture of one of the inns. My favorite (pictured above) has a courtyard with a garden. The inn is called Rooms to Let located at 83 Horatio St, New York, NY 10014-1518. ILoveInns.com website makes it easy for you to browse through all the different inns. It contains pictures of the different inns with all the information you need to book a room. You can follow the links to each inns' website. You can also buy gift certificates that can be used at any of the inns. By the way, they have a catalog for sale that can give you additional savings. Visit the site for more info!